I do not know when I first saw this recipe, but I do know where: it was on Ming Tsai’s PBS series Simply Ming , and that season he was still doing the “Asian ingredient, Western ingredient” thing. 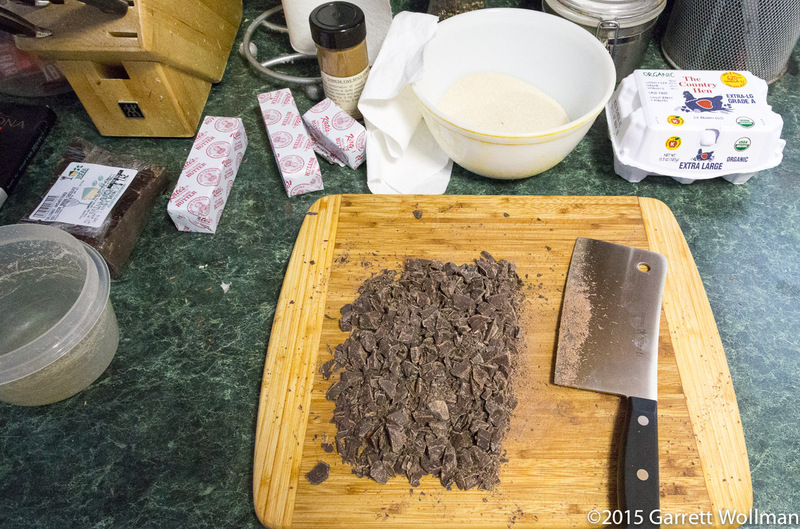 The featured ingredients for that episode were chocolate and five-spice powder, a combination of ground spices including star anise commonly used in Chinese cooking. I have a printout from the Web site — there’s a PostScript error message on one side, thankfully not obscuring anything important — with the very simple recipe. This notion of a “flourless chocolate cake” was still in its heyday (it seems now to have rather gone by the wayside, although there’s a lot to recommend it even for people who like baked goods with wheat flour, occupying a culinary niche somewhere between super-sugary desserts like fudge and super-rich chocolate tortes. It’s also not horribly high-calorie, unlike most cakes and tortes, so those of us who are watching our calorie intake can indulge without making too much of a sacrifice. It starts, of course, with chocolate. 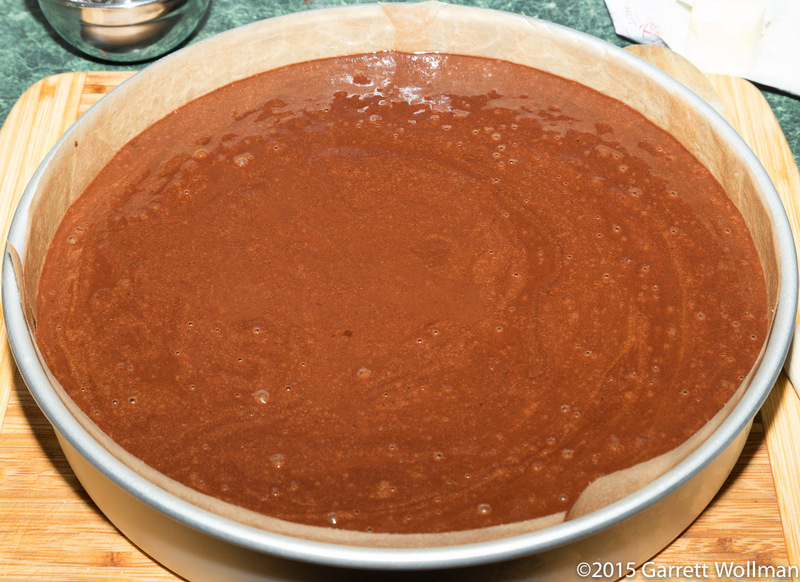 (I suppose a flourless cake could be made with cocoa, but call me dubious.) This recipe uses both bittersweet chocolate (I used Valrhona Caraïbe 66%) and unsweetened (I used Callebaut) — although, strangely enough, it then adds more sugar to the chocolate after it’s melted by mixing in a simple syrup. 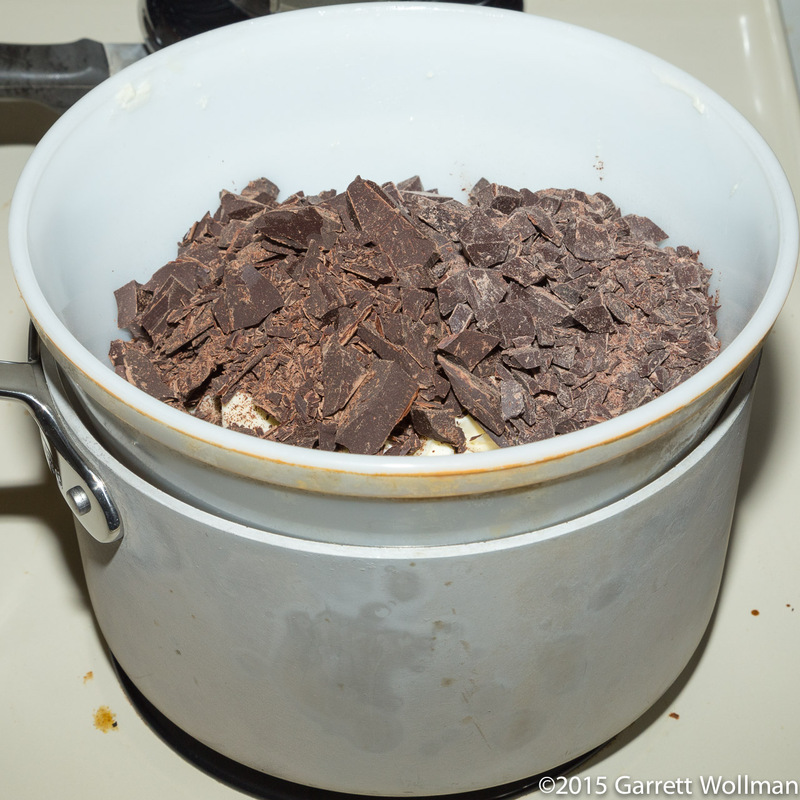 Before melting, the chocolate must be chopped up, and I find a cleaver works best for this. 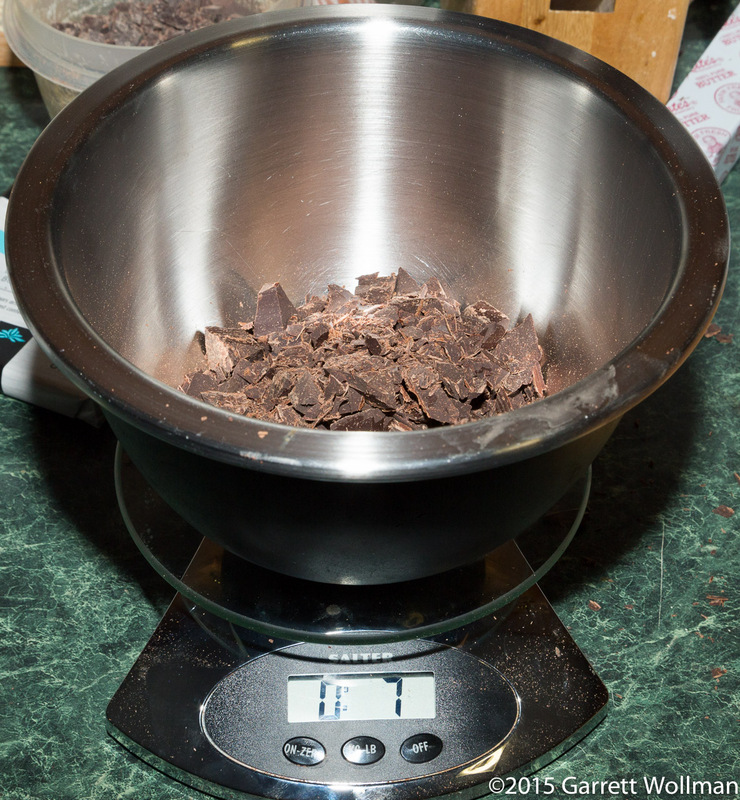 I always re-weigh chocolate after chopping — there’s no telling how much you lose when little bits scatter across the counter, fall on the floor, etc. — and in this case I was a little short, and had to make it up with a different kind of chocolate (Callebaut 70-30-NV in broken bits from the Whole Foods cheese department). 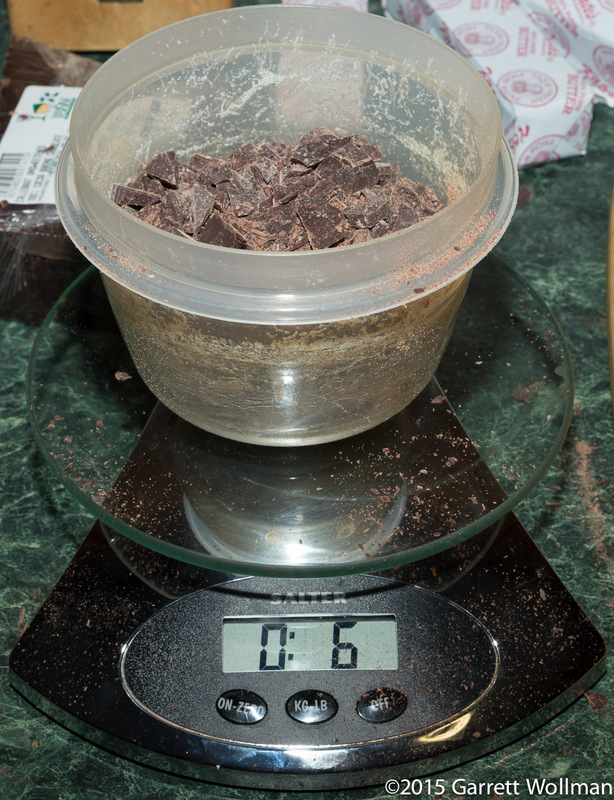 I weighed the two chocolates in separate containers, although if I had read ahead in the recipe (which is a short one) I would have noticed that they are melted together in a double boiler, so I could have saved myself some cleanup. 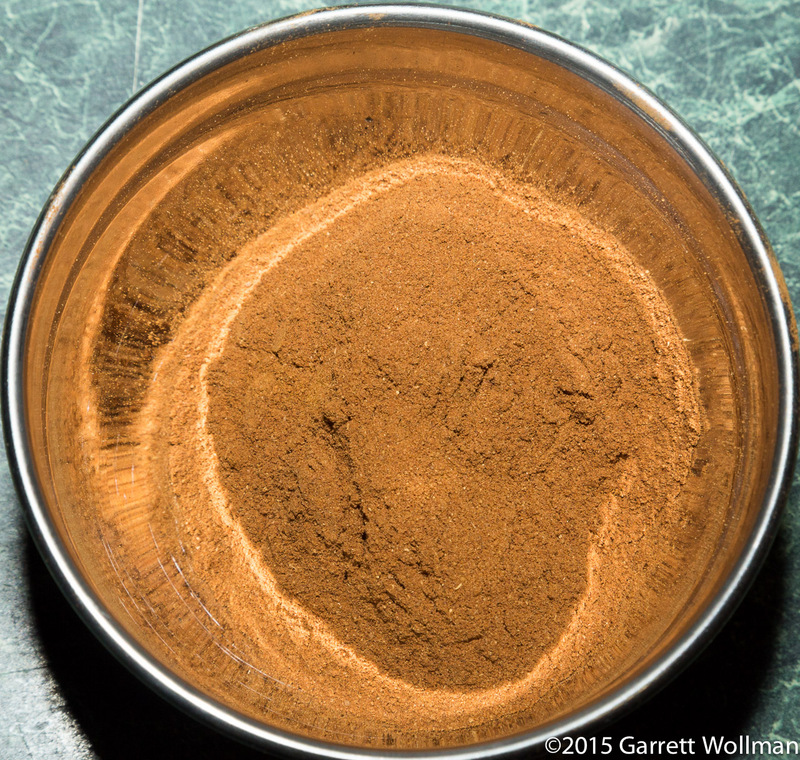 As befits the theme ingredient of the episode this recipe came from, there is a lot of five-spice powder in the recipe. 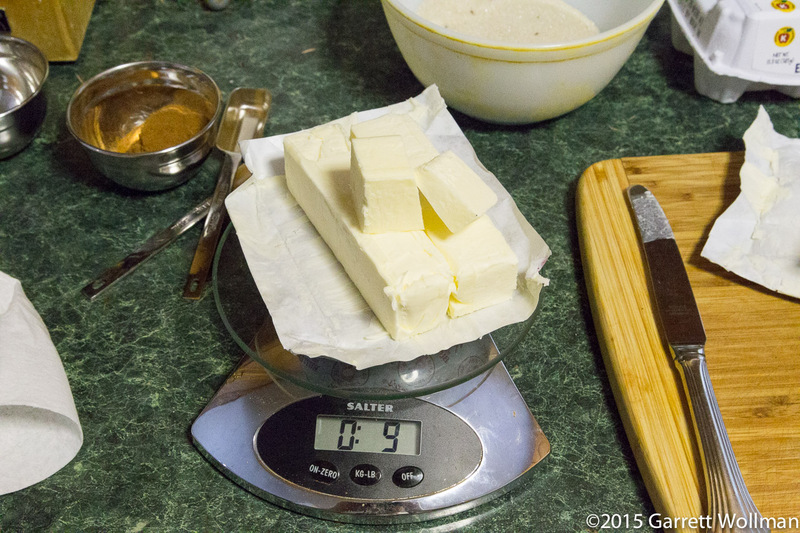 I measured it out and came up with 17 grams — more than half an ounce — which may save you a few seconds measuring if you should try to make this recipe yourself. There’s also a lot of butter in this cake — a surprising amount, really, more than half a pound. 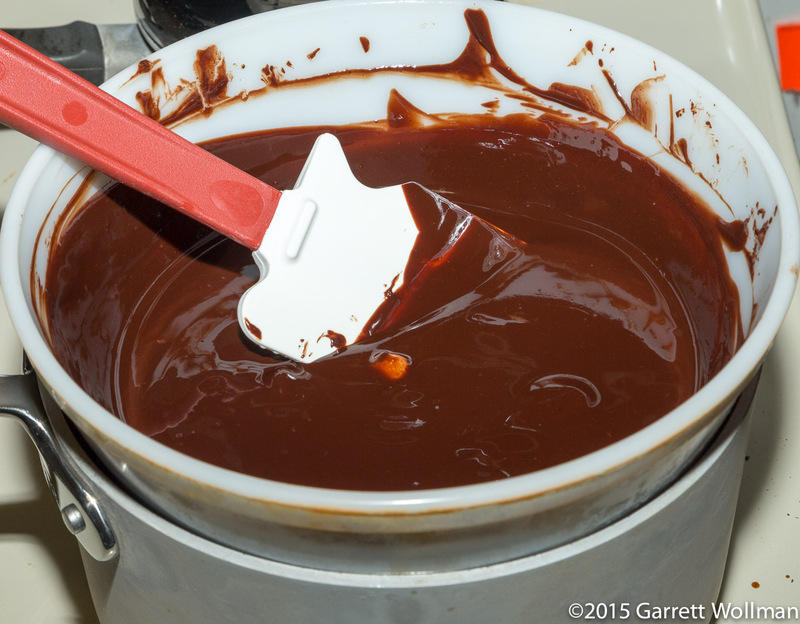 The two chocolates and the butter are melted together in a double boiler over simmering water. I don’t have room in my kitchen for a double boiler when a simple Pyrex bowl sitting atop a saucepan of water works just as well. 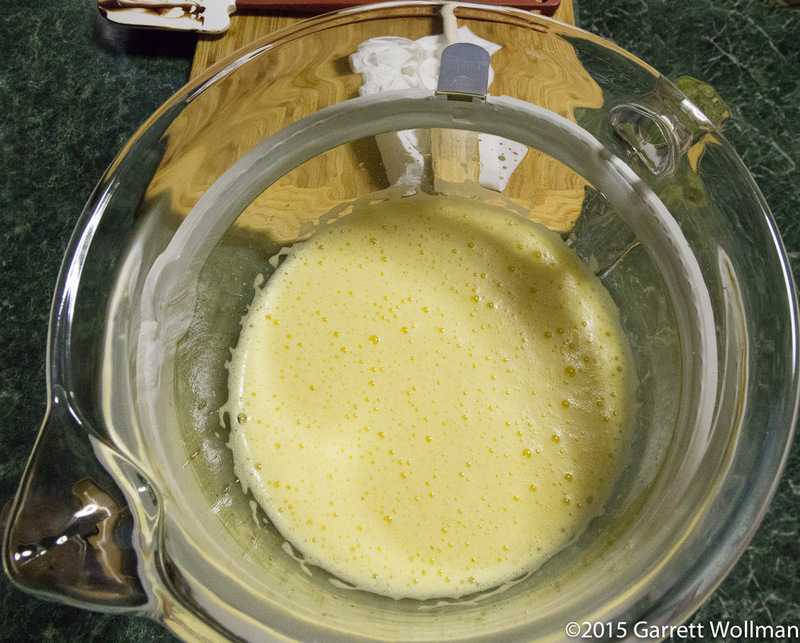 The chocolate-butter mixture is almost completely melted — you can still see a few chunks of unmelted butter. 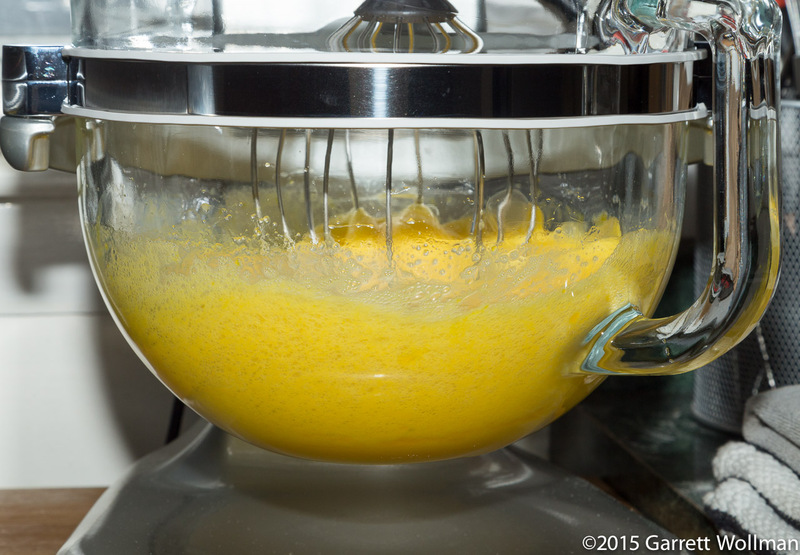 Once the butter is completely melted, a 1:1 simple syrup (made in a separate saucepan) is whisked into the mixture to sweeten it up. 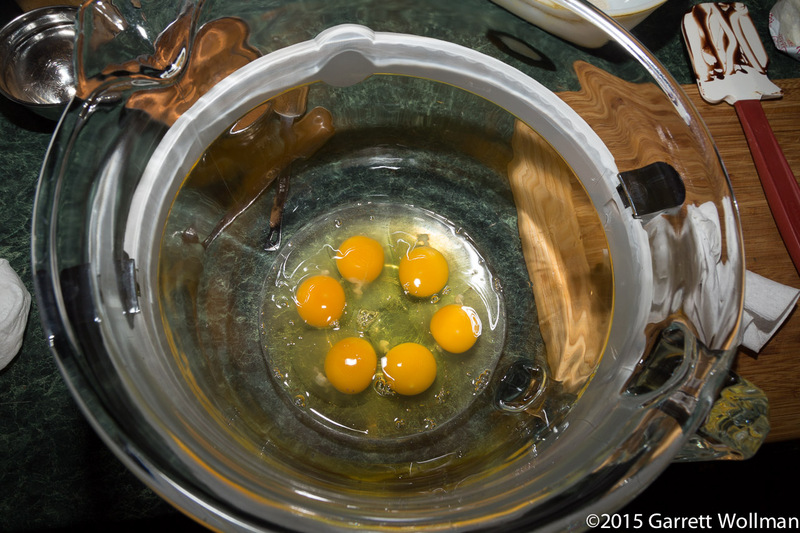 The recipe calls for six extra-large eggs. Most recipes call for regular large eggs. The difference between the two sizes is fairly small, but since I had to buy eggs anyway, I bought a half-dozen extra-large eggs. These were clearly good quality and fresh, based on the appearance. The eggs and more sugar are whipped together “until tripled in size” — I assume Tsai means “tripled in volume” here, since there’s no other plausible meaning. Whipping the eggs with sugar creates a foam that gives the cake its final texture, and also helps to protect the eggs from curdling when the still-hot chocolate-butter mixture is folded into it. OK, here’s the “this is what it looks like before it goes in the oven” photo that I almost always forget to take. 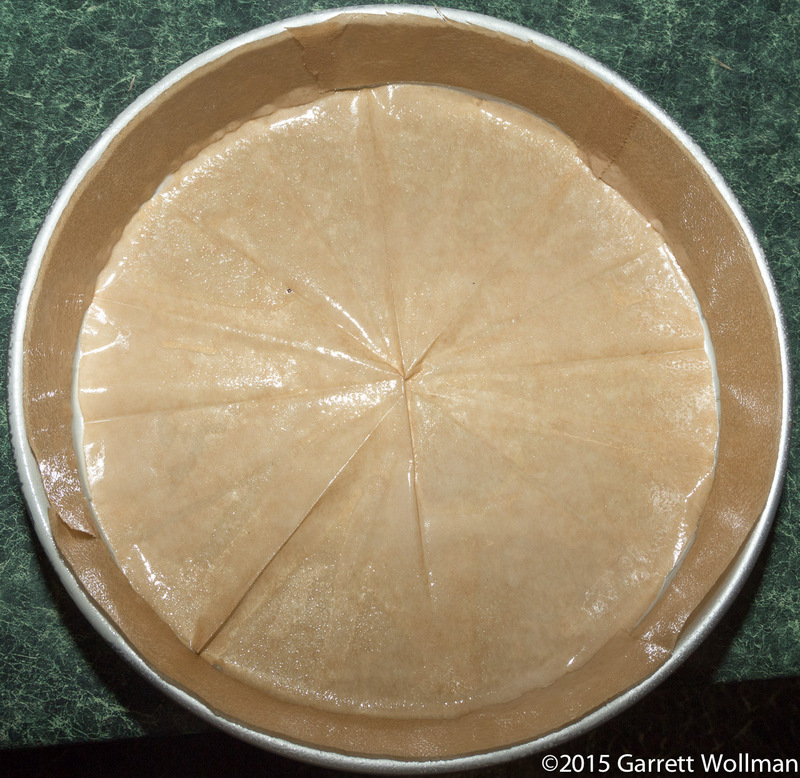 Note how high the batter comes up the edge — I might have had a bit of trouble fitting all that cake into a standard 9″x2″ cake pan, although a 9″x3″ springform would have been just fine (modulo adjustments in cooking time). 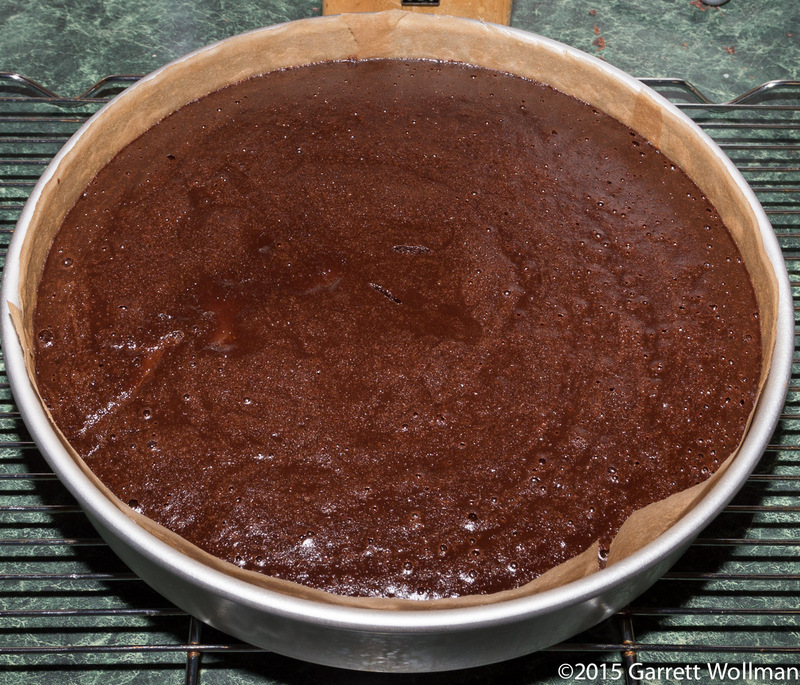 The recipe calls for cooking this in a water bath — I had to buy a disposable aluminum roasting pan as this 10-inch cake pan is now the largest non-disposable pan I own! And now it’s done and cooling on the rack. 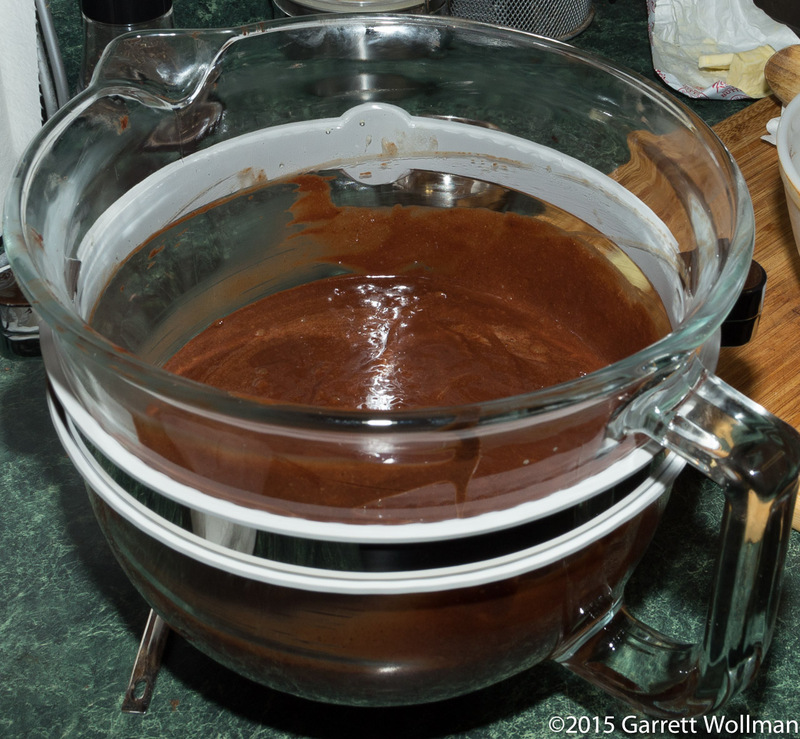 The recipe says 50–70 minutes at a very low 275°F; if I recall correctly, I gave it about 65 minutes. The recipe also gives a somewhat unusual doneness test. Tsai says “check that batter clinging to the knife has a spongy, pudding-like consistency” — I think I got that here. To slice this cake really demands a clean, warm knife for every cut. I got twelve slices quite easily — the recipe doesn’t specify, but for a ten-inch pan that’s a pretty reasonably number. 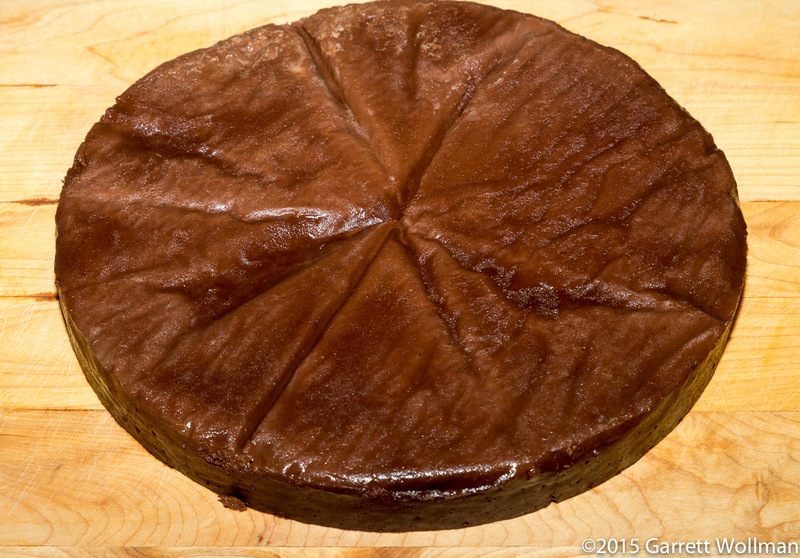 (A thicker cake baked in a nine-inch pan might be a challenge to get that many slices from, so I’m glad I splurged and bought the 10″ pan just for this recipe.) I could see a restaurant baking individual cakes in ramekins, probably 12 to 16 per recipe, which might be an easier option for home cooks as well — if you have that many ramekins to begin with. PS: I’d include a link to the recipe on Tsai’s Web site, ming.com, but it doesn’t appear to be available any more. I’ve asked about it on Twitter; we’ll see if anything comes of that. There’s actually (surprisingly) no salt in this recipe, so if I’m not mistaken it meets FDA guidelines as a “low-sodium food”. 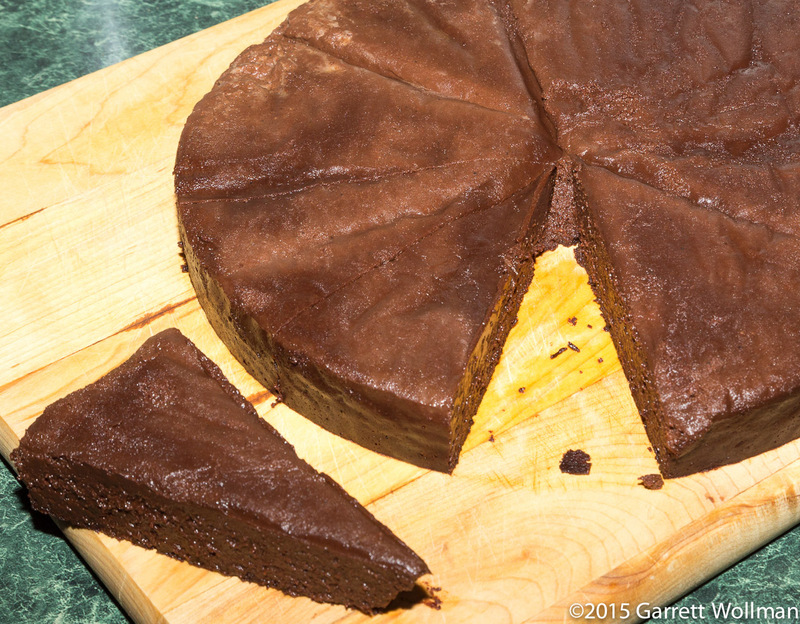 Gallery | This entry was posted in Food and tagged chocolate, five-spice powder, flourless chocolate cake, gluten-free, Ming Tsai, recipe. Bookmark the permalink.